Aims and Objectives: A keratocystic odontogenic tumour (KCOT) is a benign uni- or multicystic, intraosseous tumour of odontogenic origin, with a characteristic lining of parakeratinized stratified squamous epithelium and potential for aggressive, infiltrative behaviour. Various studies in hamsters showed that, alpha-Tocopherol, which is an active biological form of Vitamin E, is a potent antioxidant known to inhibit tumour formation and also regression of established tumours. So, the aim of the present pilot study was to assess the levels of Alpha-Tocopherol(Vitamin E) in Patients with KCOT and compare them with Vitamin E levels in normal healthy individuals. Materials and Methods: A sample of 20 individuals were taken and Alpha Tocopherol levels in serum were assessed. Independent sample t test was used to analyse the data. Serum Vitamin-E levels were found to be decreased in KCOT cases. Results: Mean Vitamin-E level was found to be decreased (mean + S.D. = 10,549.34 +/- 2494.21 ng/mL) as compared to healthy controls (mean + S.D. = 13,982.42 +/- 2178.02 ng/mL). 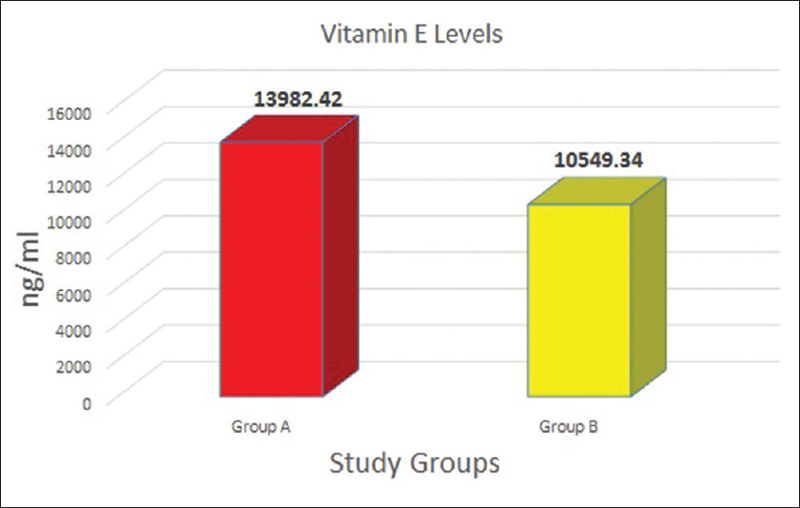 The reduction in serum vitamin E level was statistically significant (P < 0.05). Conclusion: The reduction in Vitamin E levels in KCOT patients might be suggestive of the possible interrelation between Vitamin E and KCOT invivo. Also, increase in intake of Vitamin E might help in reducing the risk of recurrence in KCOT by reducing the dysregulation of Cyclin D1 and Down-Regulation of mutant p53. Context: Dental practitioners who usually have to work for long durations in a particular fixed posture are more prone to musculoskeletal disorders (MSDs), particularly those involving the hand and wrist and also of the lower back. Aims: To study the prevalence of carpal tunnel syndrome (CTS) and low back pain (LBP) among dental practitioners and to correlate the symptoms with the duration of practice. 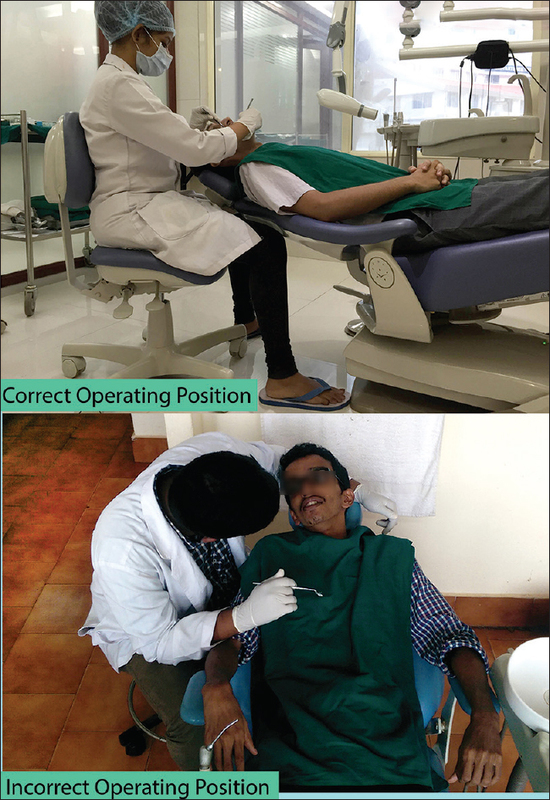 Subjects and Methods: A closed-end questionnaire was distributed to 100 dental practitioners from Dakshina Kannada and Coorg districts of Karnataka, India. Statistical Analysis Used: Analyses were carried out using Chi-square test and Fisher's exact test. Results: The study found that 86% of the total population of dentists practicing for more than 5 years showed symptoms of CTS and 54.0% experienced LBP. Conclusion: Symptoms of MSDs related to hands, wrists, and low back is widely prevalent among the dentists, which severely impact their work efficiency. Precautionary measures early in the clinical practice such as proper ergonomics in the operating field and few strengthening exercises as described in this study can reduce the onset and progression of the symptoms. Background: Periodontitis is a chronic inflammatory disease which is multifactorial. Diabetes mellitus (DM) is one of the major systemic factors to influence the severity of chronic periodontitis. Numerous inflammatory markers are produced in the course of the disease which is secreted in saliva too. 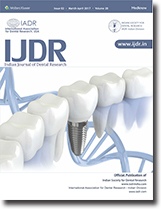 This study evaluates the salivary concentrations of interleukin-6 (IL-6) in periodontitis patients with type 2 diabetes. Materials and Methods: Whole saliva samples were collected from eighty patients who were further divided into four groups; healthy (control group; n = 20), untreated periodontitis (UPD; n = 20), DM (DM; n = 20), and UPD + DM (n = 20 groups). Salivary IL-6 concentrations were determined by standard enzyme-linked immunosorbent assay. Results: Results show that the UPD patients with and without DM exhibited higher concentrations of salivary IL-6 than the control group and diabetes groups. Further, the salivary IL-6 was correlated with glycosylated hemoglobin A levels in patients with diabetes. Conclusion: Concentration of salivary IL-6 was elevated in patients with periodontitis with and without diabetes. Thus, salivary IL–6 levels can be considered as an important biomarker in the diagnosis of periodontitis and diabetes. Background: Different diagnostic screening tests have been developed to detect periodontal disease in the early stages. Despite these advances still, there is a need for a more practical and beneficial diagnostic test. Aim: The aim of this study was to investigate the possibility of developing such a kit based on the body immune response against Porphyromonas gingivalis. Method and Materials: This experimental study was conducted by culturing P. gingivalis and extracting its antigens. These antigens were injected into peritoneal cavity of four Balb/c mice. Finally, the pattern, type, and quantity of antibody response against P. gingivalis antigen were detected. Results of the study showed that 3.0 × 108 cells of P. gingivalis are an appropriate count for stimulating the immunization in Balb/c mice and the subsequent amount of antibody (IgG) production was 81.5 μg/ml. Result: The antigenic injections which were done in the current study could mimic the condition of periodontal disease and the raise of P. gingivalis in the body. Conclusion: The obtained data can be used in future attempts to develop practical and usable test kits against P. gingivalis. Objective: To evaluate a quick, safe, and minimally invasive method to screen for diabetes using gingival blood with the help of self-monitoring glucometer during periodontal examination. Materials and Methods: A hospital–based, cross-sectional comparative study was conducted among 40–59-year-old diabetic and nondiabetic population who had come for their master health examination to a private tertiary care hospital (Global Hospital and Health City) in Chennai. Among them, those who fulfilled the inclusion criteria were selected for the study. Thirty diabetic and thirty nondiabetic patients with moderate to severe gingivitis were enrolled and subjected to routine clinical periodontal examination. Blood samples of two sites were analyzed using a glucose self-monitoring device (Accu-Check). Patients were tested for venous fasting blood sugar (VFBS), venous postprandial blood sugar (VPPS), gingival fasting blood sugar (GFBS) level, gingival postprandial blood sugar (GPPS) level, peripheral fingerstick fasting blood sugar (PFBS) level, and peripheral fingerstick postprandial sugar (PPPS) level. Data obtained were statistically analyzed using Student's t-test, ANOVA, and Pearson's correlation test. 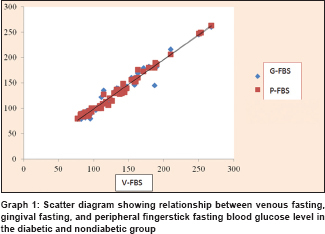 Results: A significant positive correlation was found between GFBS and VFBS, GFBS and PFBS, GPPS and VPPS, and GPPS and PPPS (P < 0.01) in both diabetic and nondiabetic patients correlation. Using venous blood glucose level as a gold standard, the sensitivity and specificity of GFBS was 93% and 100%, respectively, whereas in GPPS, the sensitivity and specificity was 80% and 96%, respectively. Conclusion: Gingival blood glucometry can be used as a minimally invasive screening tool for diabetes mellitus in dental clinics. Aims: This study aims to compare the efficacy of a mango (Mangifera indica) leaf mouthwash with chlorhexidine on plaque status, gingival status, and salivary Streptococcus mutans count. 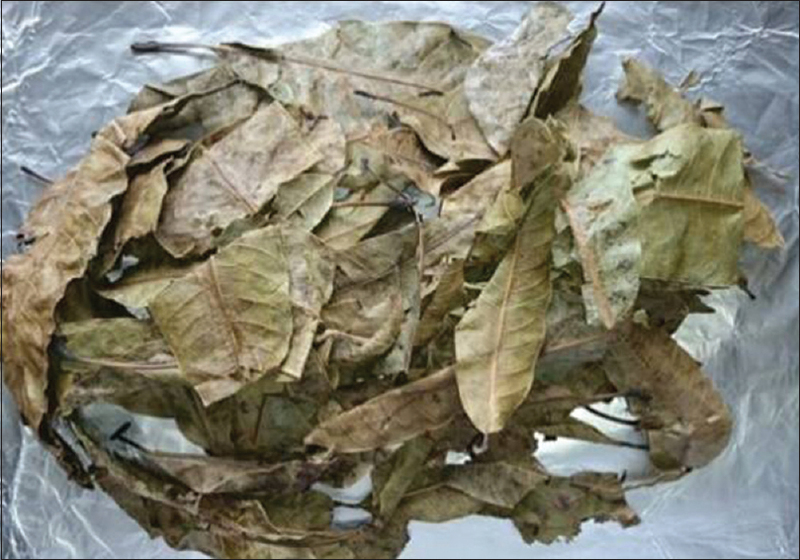 Materials and Methods: A sample of twenty children, aged 8–14 years, Mangalore Residential School, Karnataka, India, was allocated into two groups. Group A (10) and Group B (10) were given test mouthwash “mango leaf mouthwash” and chlorhexidine, respectively. The clinical trial was carried out for ½ h after rinsing and after 5 days, during which children were asked to rinse once daily, with 10 ml of the given mouthwash ½ h after tooth brushing. Results: There was a significant reduction in microbial count, improved plaque control and gingival health in mango leaf and chlorhexidine mouthwash groups with higher reduction in microbial count, and better plaque control and gingival health seen in chlorhexidine group. Conclusion: Herbal alternatives proved to be an effective and safe alternative to conventional modes of treatment. Background: Culture and ethnicity are among the factors affecting esthetic judgment of individuals. Aims: This study aimed to assess the acceptability threshold of variations in four components of an esthetic smile namely vertical lip thickness, dental midline deviation, buccal corridor, and the golden ratio in maxillary lateral incisors display among laypersons of different races and cultures. 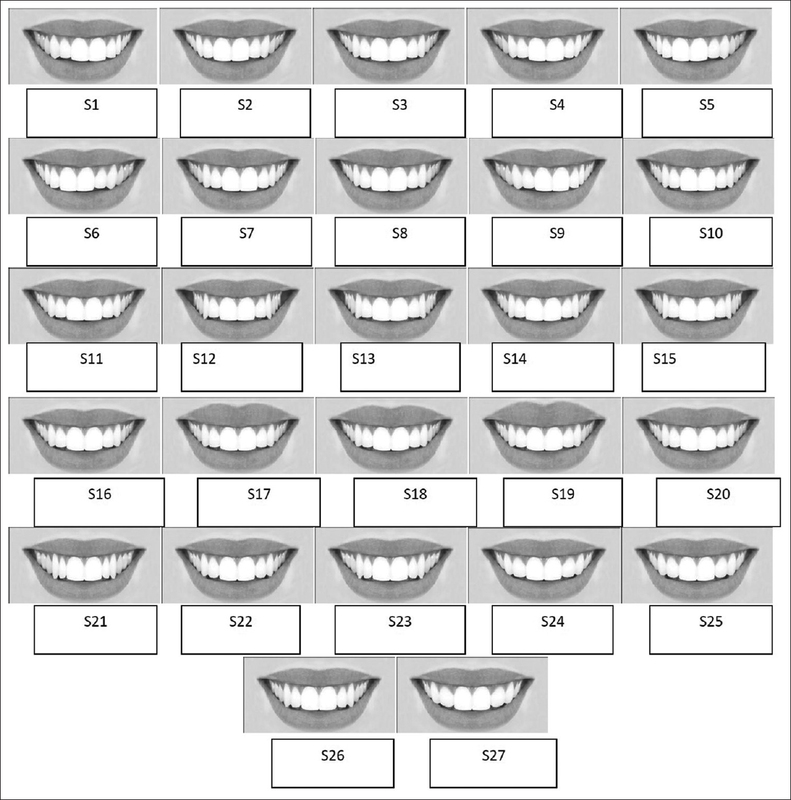 Subjects and Methods: Raters (n = 35 in each city) among laypersons of nine cities namely Istanbul, Isfahan, Tabriz, Tehran, Doha, Rome, Sydney, Chicago, and Yazd, were given a photo album containing 27 random images of an attractive female smile, digitally altered with regard to the four smile components. They scored each picture from 0 to 100 in terms of smile attractiveness. Statistical Analysis: Data were analyzed using SPSS 13 and the acceptability threshold for each component was calculated in each city using the Spearman and Wilcoxon tests. P< 0.05 was considered statistically significant. Results: No significant differences were noted with regard to the increased vertical lip thickness, and an acceptability threshold could not be determined for it. The acceptability thresholds for midline deviations, buccal corridor, and the golden ratio were different among different cities. One-millimeter increase in the displayed width of maxillary lateral incisors was more desirable than the golden ratio standard width. Conclusion: Culture and race may significantly affect the esthetic preference of individuals with regard to smile attractiveness. Background: Oral squamous cell carcinoma (OSCC) is the most common malignant tumor in the oral and maxillofacial region. The diagnosis in most cases is made at advanced stages with lymph node metastases and thus has a poor prognosis. Evidence suggests that detection of molecular abnormalities might be useful in screening for early malignancy. Cytokeratins (CKs) are part of the epithelial cytoskeleton. In malignancy, some CK filament fragments might be released in the serum. CK19 fragment Cyfra 21-1 is useful tumor marker for squamous cell carcinoma, but its clinical value in OSCC has not been confirmed. Hence, the aim was to investigate the diagnostic value of serum Cyfra 21-1 in OSCC patients. Materials and Methods: The preoperative serum Cyfra 21-1 concentration of forty OSCC patients and forty healthy controls was detected by enzyme-linked immunosorbent assay (ELISA) using a commercial Cyfra 21-1 ELISA kit Xema Co., Ltd., Moscow, Russia. All statistical analyses were performed on STATISTICA statistical software (Windows version 6.0). Results: There was a statistically significant difference (P < 0.001) of mean serum Cyfra 21-1 levels (ng/mL) between OSCC cases (1.76 ± 0.81) and healthy controls (0.43 ± 0.14). The difference between controls and Stage III and Stage IV was also statistically significant (P < 0.001). The mean serum Cyfra 21-1 level was lower in histopathological Grade I cases (1.72 ± 0.78) than Grade II (2.04 ± 1.13), but the difference was not statistically significant (P = 0.459). Conclusion: It could thus be conjectured from the present study that increased serum Cyfra 21-1 level can be used as an adjunctive serological marker for the OSCC disease staging. Background: Temporomandibular joint (TMJ) ankylosis is a situation in which the mandibular condyle is fused to the glenoid fossa by bone or fibrous tissue. The management of TMJ ankylosis has a complicated chore, and it is challenging for the maxillofacial surgeon because of technical hitches and high rate of reankylosis. Costochondral graft (CCG) is a common treatment modality for TMJ ankylosis. One of disadvantages of CCG is unpredictability of growth pattern and risk of overgrowth. This report illustrates the fate of CCG used in the TMJ reconstruction and also the management of patients with CCG overgrowth. Materials and Methods: A retrospective evaluation of 14 patients presented with unilateral TMJ ankylosis reconstructed using CCG treated in our hospital from 2000 to 2013 was done. Only patients with unilateral ankylosis treated by CCG with at least 2-year follow-up and complete case records with clinical and radiographic details were included in the study. Patients with bilateral ankylosis, reankylosis, missing details, and the patients with <2-year follow-up were excluded from the study. The patients were selected based on the specified inclusion/exclusion criteria. All the patients were analyzed clinically and radiographically. Facial appearance, jaw motion, occlusion, contour, and linear growth changes were documented preoperatively, immediately postoperatively, and long term (>2 years). Results: Totally 14 unilateral temporomandibular ankylosis cases were reconstructed using CCG from the period of 2000–2013. The mean age of the patients is 5.2 years with the standard deviation of 1.48 ranging from 3 to 9 years. Follow-up of the patients ranges from 2 to 6 years with mean follow-up of 3 years. Out of 14 patients, 2 patients had normal growth of CCG after the mean follow-up of 3 years, whereas 5 patients presented with moderate growth, 4 patients with CCG overgrowth, and 3 patients presented with no growth of CCG following surgery. 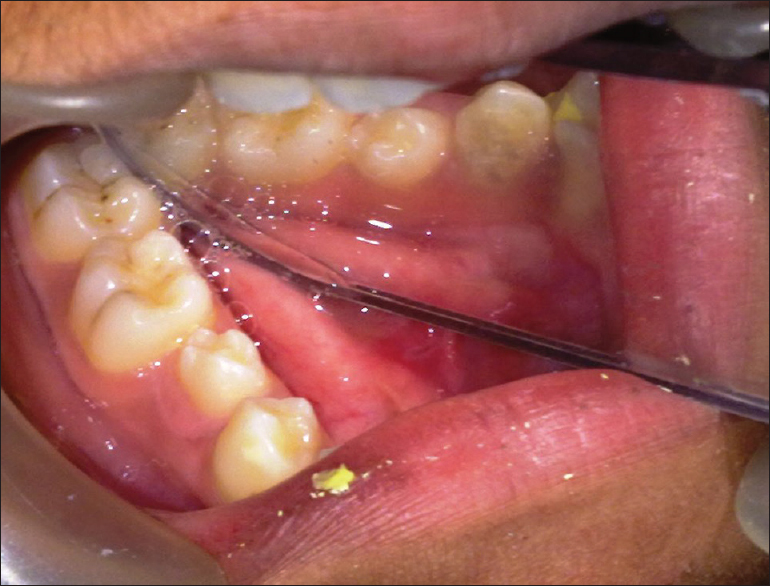 Overgrown CCG was treated with condylar shaving, and orthodontic elastic was maintained to stabilize the occlusion. Moderately grown and nongrowing CCG was treated by internal distractor for the management of facial symmetry. Facial asymmetry and malocclusion were successfully corrected in all patients with altered growth pattern. Conclusion: The growth pattern of the CCG is extremely unpredictable, which can be in the form of no growth at all or excessive growth, and mandibular overgrowth on the grafted site can actually be more troublesome than the lack of growth. Care should also be taken to ensure proper postoperative functional therapy and to examine the role of cartilage thickness on future growth in young patients. Aim: The aim of the present study is volumetric analysis of root canal filling with cold lateral compaction, Obtura II, Thermafil, and Calamus using spiral computerized tomography (SCT). 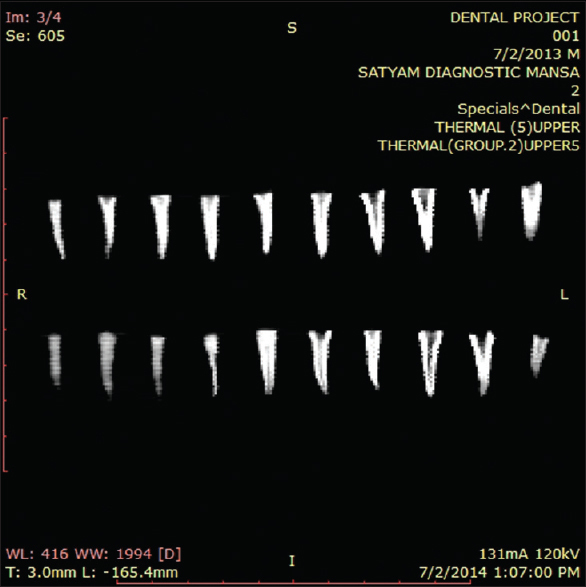 Materials and Methods: Root canals of eighty mandibular premolars were instrumented using rotary ProTaper, and the volume of the canal space was measured using spiral computerized tomography (SCT). The teeth were divided into four groups of twenty teeth each, and root canals filled by lateral compaction technique, Thermafil carriers, Obtura II, and Calamus techniques, respectively. AH Plus was used as a sealer with all techniques. The filled volume in each canal was measured using SCT, and the percentage of obturated volume (POV) was calculated. The data were statistically analyzed using ANOVA, Kruskal–Wallis test, and Mann–Whitney U-test. Results: The four groups were comparable in canal volume. The overall POV was 78.11%, 85.72%, 82.50%, and 87.89% for lateral compaction, Thermafil, Obtura II, and Calamus, respectively (P < 0.05). Conclusion: The greatest POV was obtained with Calamus and Thermafil. Voids were seen in all root fillings. Aim: The aim of this study was to compare the canal transportation and canal centering ability in the preparation of curved root canals after instrumentation with V-Taper 2H, ProTaper Next (PN), and Hyflex CM files using cone-beam computed tomography (CBCT). 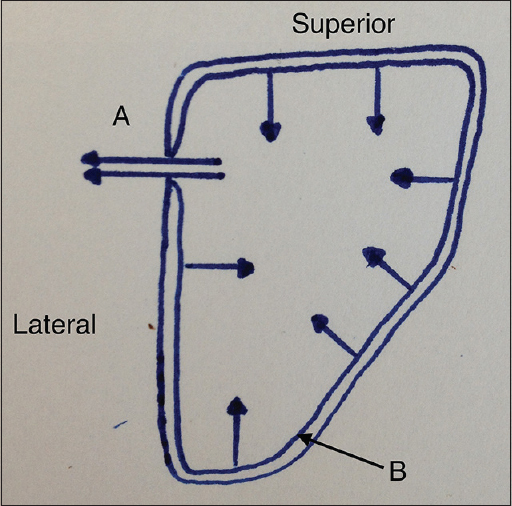 Materials and Methods: Thirty mesiobuccal canals of mandibular molars with an angle of curvature ranging from 20 to 40 were divided according to the instrument used in canal preparation into three groups of ten samples each: V-Taper 2H (Group 1), PN (Group 2), and Hyflex CM (Group 3). The teeth were instrumented according to manufacturer's guidelines up to 30 no. apical preparation. Canals were scanned using a CBCT scanner before and after preparation to evaluate the transportation and centering ratio at 3 mm, 6 mm, and 9 mm from the apex. The amount of transportation and centering ability was assessed. The three groups were statistically compared with analysis of variance and post hoc Tukey test. Results: All instruments maintained the original canal curvature with significant differences between the different files. Data suggested that V-Taper 2H files presented the best outcomes for both the variables evaluated. V-Taper 2H files caused lesser transportation and remained better centered in the canal than PN and Hyflex CM files. 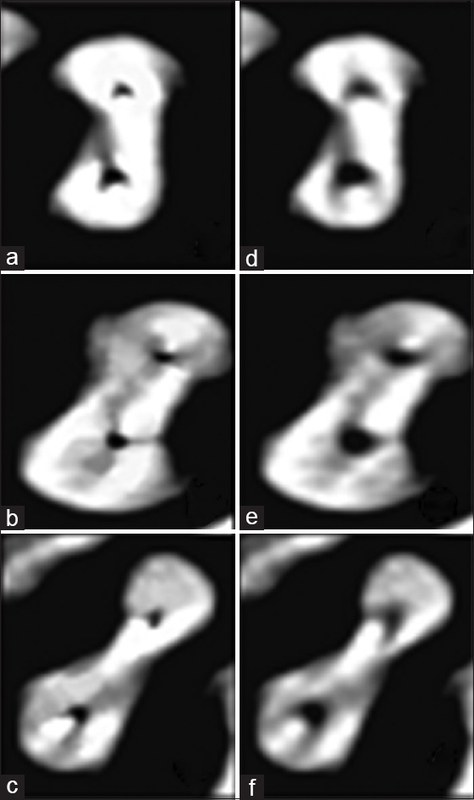 However, it was seen that PN caused less transportation in apical level than Hyflex CM. Conclusion: The canal preparation with V-Taper 2H showed lesser transportation and better centering ability than PN and Hyflex CM. The objective of this paper is to discuss and put forward the various diversified roles of cyclin D1 in cancer. Neoplasia is defined by abnormal regulation of the cell cycle. 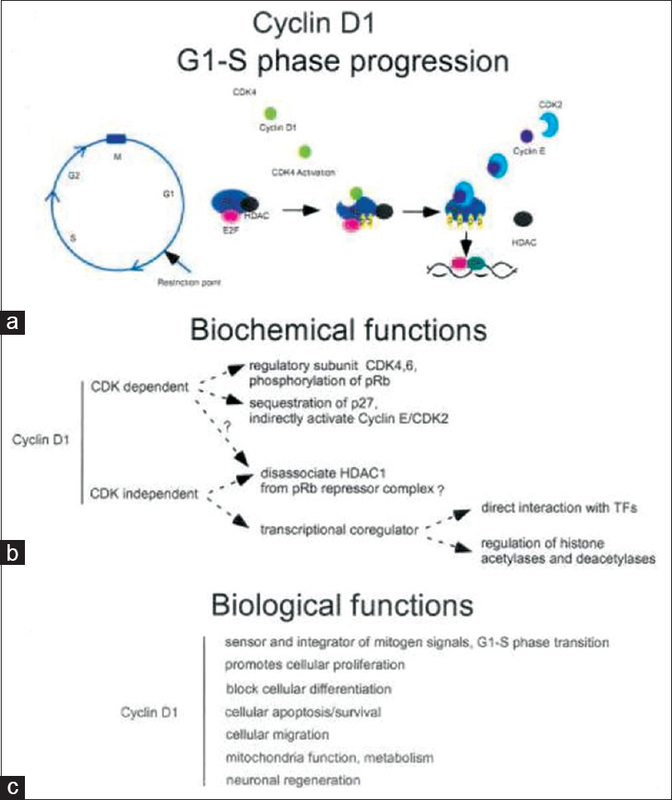 Cyclin D1 could be a protein derived from the PRAD1, CCND1, or bcl-1 sequence on body 11q13 that is concerned in each traditional regulation of the cell cycle and pathologic process. Within the G1 (resting) part of the cell cycle, cyclin D1 in conjunction with its cyclin-dependent enzyme (cyclin-dependent kinase) partner is accountable for transition to the S (DNA synthesis) part by phosphorylating the merchandise of the metastatic tumor sequence (protein retinoblastoma) that then releases transcription factors vital within the initiation of DNA replication. Amplification of the sequence or overexpression of the cyclin D1 releases a cell from its traditional controls and causes transformation to a malignant composition. Analysis of those changes provides vital diagnostic information in oral carcinogenesis and is of prognostic value in several cancers. Data of cyclin D1's role in malignancy at the assorted sites provide a basis on which future treatment directed against this molecule will proceed. Aim: With the increased demand to undertake dental aesthetic and reconstructive procedures, it is imperative for all dental clinicians to have an understanding of body dysmorphic disorder (BDD). Patient's preoccupations with perceived defect in appearance or excessive concern about minimal flaws are among diagnostic criteria of BDD. Such patients are difficult to please and often undergo cosmetic procedures such as orthodontic treatment. Methodology: Literature search in PubMed/MEDLINE was conducted from 1891 to 2015. A manual search of relevant articles and review was done and relevant data was collected and analysed. Results: One of the most common areas of preoccupation is the dento-facial region, with up to 20% of patients diagnosed with BDD expressing specific concern regarding their dental appearance. Conclusion: BDD patients often request multiple aesthetic procedures, but remain unsatisfied with their treatment results. Miniscrew implant (MSI) has been reported to be an excellent, supportive orthodontic anchorage tool. The placement of MSI is not free from complication and foremost of which is penetration of MSI into the vital tooth structures. 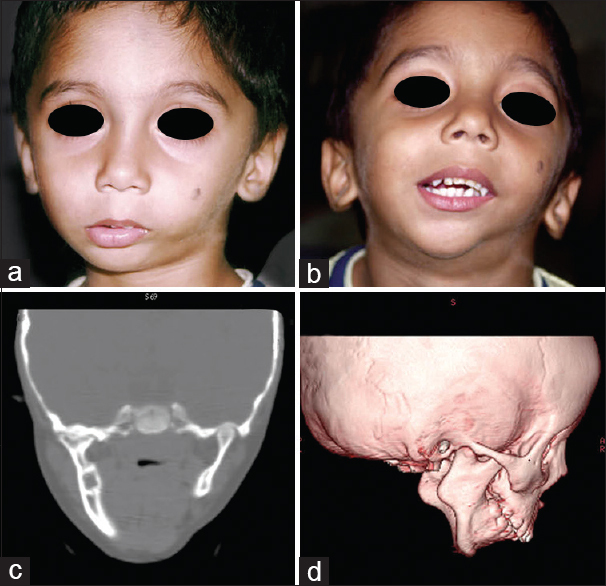 This case report is probably the first to report a newer underreported complication. Interestingly, a small bit of gingival tissue was found deep inside the dentin of the tooth, surviving and proliferating in the MSI-damaged zone. 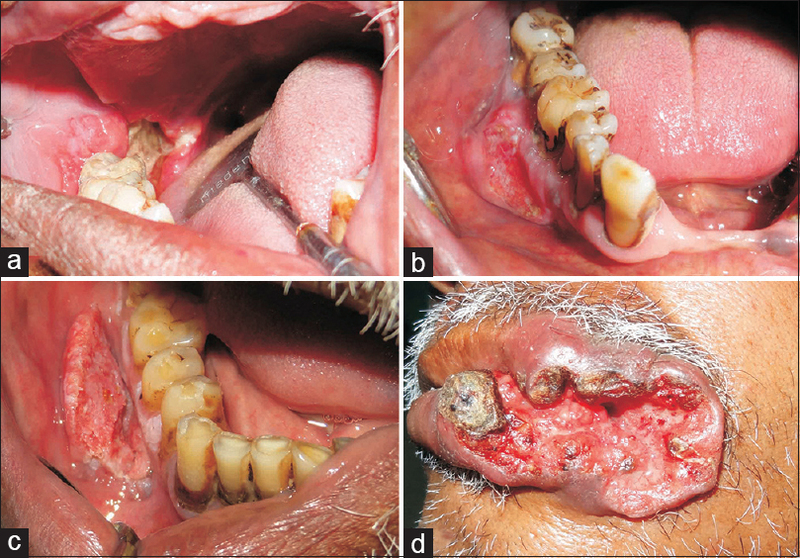 This case report is probably the first to give direct histological evidence in humans that a MSI can cause implantation phenomenon which has the potential to give rise to numerous pathologies including pulpal, periodontal, and cystic transformation. Through this report, it is emphasized that clinicians should have a structured, formal MSI placement training to avoid such instances and also underlines the need to develop protocols to be followed in the instance of an inadvertent MSI penetration. Dens invaginatus is a rare malformation affecting the teeth. The teeth that are most commonly affected are the permanent maxillary lateral incisors. The mandibular posterior teeth are rarely affected by dens invaginatus. In most of the cases, a single dens invaginatus is seen affecting the tooth. Cases of double dens invaginatus affecting a single tooth are rare, and those of triple dens invaginatus in a single tooth are even rarer. Here, we present a case of a 14-year-old where three dens invaginatus were seen in the mandibular second premolar. This is the fourth case of three dens invaginatus in a single tooth as only three have been reported previously. A minimum subantral bone height in the posterior maxilla may require a bone augmentation where a sinus lift procedure is the most commonly used technique, either preceding or simultaneously with the implant installation. While elevating the Schneiderian membrane ruptures are common, possibly resulting in less bone formation. In this paper, we propose the surgical pneumatization of the Schneiderian membrane as a new technique to minimize the risk of such complications. This can be achieved mainly by creating a hole for the immediate and increased passage of air through the Schneiderian membrane and the maxillary sinus wall above the region of augmentation.